Add 2 Door Sweeps to Cart, Get $1 Off each! I can see daylight under my doors so I thought I would give this a try. I need to stop the draft and the insects coming under the door between the garage and kitchen. We have draft from on of our doors. It pays for itself in the money saved on utility bills. Seems a perfect solution for my apartment door. Needed to stop draft between garage and house door. Because l need a strip to put on the bottom of my door. Great utilities saver for heat and air in my front door as well as my back door! Needed to stop wind from blowing dirt under the door. Price was good. 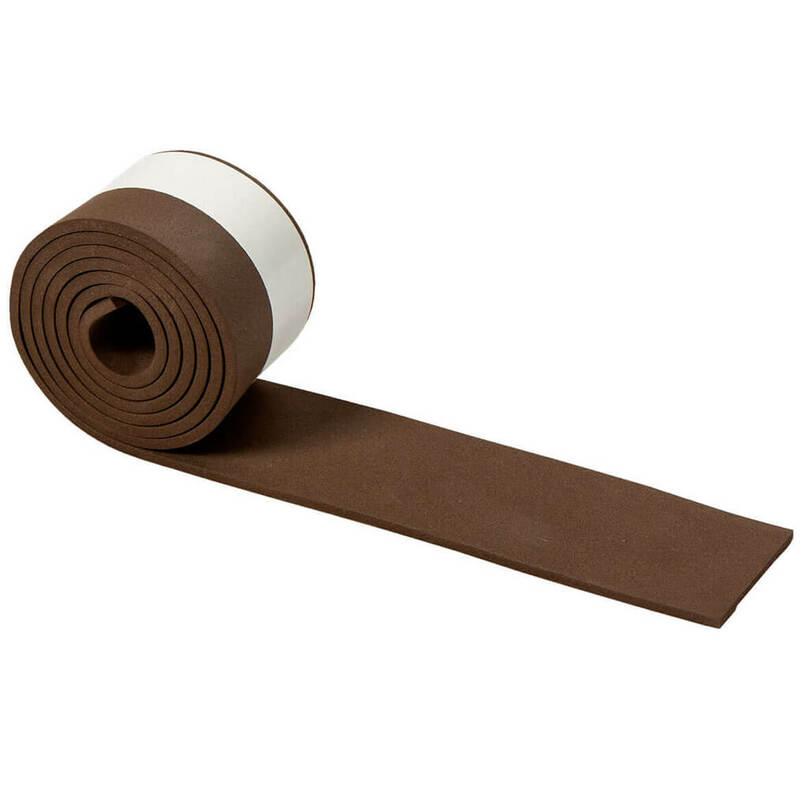 These weatherstrips will help in stopping the draft from storage closet. This particular closet is not insulated and the cold air pours in at the bottom of the doors. To cut down on drafts. I need this for my front door. To make my door seal better so no drafts come in. My home is old and the doors are drafty - looks like a good idea. I know a lot of air comes in and escapes at the bottom of the door so I thought this would be a good thing to get and put at the bottom of my doors to keep hot air out in the summer and cold air out in the winter. Hopefully it will save us some money on our heating and air conditioning bills. Keep out drafts on the door to the attached garage.. Need this item to go across bottom of doors and price was very good. I need this weatherstripping for my doors. have large space under door and want to stop the draft. will this work on an aluminium storm door? BEST ANSWER: Yes it does. But I have used it on my outside door (partial screen door- Made of metal) as a wind gap-flap. Clean the area off first and dry it as well. Press and hold. It has been on for over 2 years! Thank you for your question. Yes, this item has a self stick strip that will stick to aluminium. We hope this information will be of help to you. BEST ANSWER: That would depend on the carpet height. It might work on indoor-outdoor (no pile, smooth) but it would not work on say, shag. It also depends on how low to the ground you want the blockage, the whole point is to block air, so, if you have it up too high (to avoid high fiber) you defeat the purpose. It sticks to the door and scrapes along the floor, so basically the flatter the better. Yes, I think so (just not plush-high pile carpet) but I would wonder if the carpet fiber would latch on to the adhesive strip and then it would not adhere as well. Make sure you press and hold for a few seconds for proper attachment. As long as the carpet is very flat and secure on the floor, it is fine. But if you try to open the door with the sweep on it over a scatter rug on a slick floor, it will catch and push the rug around. Not on a thick carpet. Best would be tile, hardwood floors and then a berber-like carpet. Hope that helps. You could adjust it a bit higher. Just make sure you can open the door before sticking it on the door. BEST ANSWER: Thank you for your question. Yes, this item is offered in brown or white. We hope this information will be of help to you. When you open and close the door does it come off? I have only used it for insulation tops and sides of my doors. Sorry I can't be of assistance. No, I have had mine on for over two years now and it is still staying on well. No, works well. Im really pleased with it & would reccomend it. Not at all it sticks very well. Could this possibly be used as a "caulk like" feature say along the bathtub and floor? Can you put a crease in it? BEST ANSWER: Thank you for your question. The Weathering strip has only a sticky glue on half the item. The bottom has no glue. It is a flexible but hard plastic and would be hard to put a crease in it. We would not suggest to use it as a caulk as it is made more for blocking drafts under doors and not for getting wet. We hope this information will be of help to you. I wouldn't put a crease in it but you could start the sticky part as close to the bottom of the floor as possible to make it look like a thick caulk and I think that would look amazing but try it first before you stick it Permanently. I would not suggest you use it for that purpose. I live in a rental. Is it easy to remove? And will it leave a mark? BEST ANSWER: Thank you for your question. It has a sticky side to attach to your door, it is easy to attach and remove. We hope this information will be of help to you. Can this product be used on windows? BEST ANSWER: I used it on my front Windows and it works great! Does it stick to aluminun doors? BEST ANSWER: Thank you for your question. This item is good for wood and aluminum doors. We hope this information will be of help to you. Thank you! I will try it on my aluminum storm doors & steel entrance doors. could you use it on baseboards? I noticed my flooring in kitchen is separating from the wall just a little and I sure would hope this would help the drafts and keep mice and bugs out. I am on a budget right now. DO YOU HAVE IT IN WHITE OR CLEAR? BEST ANSWER: Thank you for your question. We do carry the Door Sweep in White and in Brown. We hope this information will be of help to you. Is this product made in the USA? If not, where is it made? BEST ANSWER: Thank you for your question. This item is made in Taiwan. We hope this information will be of help to you.